Anyone who follows this blog probably knows that TrustMovies is no fan of Jean-Luc Godard. 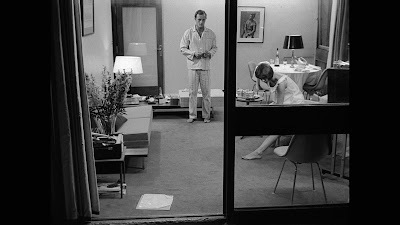 I find the guy intellectually callow, pretentious to a fault and with a battery of films that range from so cutesy you could barf (Breathless and especially Pierrot Le Fou) to deliberately inscrutable enough to bore you to distraction (Film Socialisme and Goodbye to Language). I have not seen all of his work (what kind of a masochist do you think I am? ), but along the way, I've viewed a few good films, the best of which I find to be Le Petit Soldat, followed by Weekend and the movie that arrives in a spanking new high-def edition this week, A MARRIED WOMAN (an exact translation from its French title, Une femme mariée). Plotwise, Godard, who also wrote the film, has his leading lady involved in a heavy-duty affair with a somewhat noted actor (Bernard Noël, above), while living with her husband and taking care of his young son. In the course of the movie we learn that the hubby -- the very hot but only somewhat jealous Philippe Leroy (below and two photos above), knew about her "flirtation" (he had her followed) but remains in the dark about just how far that flirtation has evolved. Ms Méril is on screen for nearly the entire movie and in almost every frame -- or at least some part of her is. In that interview the actress explains that she never knew whether Godard was filming all of her or only a part of her (or which part). She commands this movie in an even a stronger manner than did another Godard star, Anna Karina, in her several films. As played by the actress, Charlotte is shallow and almost completely incurious intellectually or even socially. She thinks the German use of Auschwitz has to do with Thalidomide rather than with the Holocaust (the movie takes place and was made in 1964, remember, when many of the facts about the Holocaust were still kept somewhat under wraps). Yet, as privileged and uncaring as Charlotte is, Méril makes her real and just important enough as a French woman of her time that we come to care about and appreciate her. Sure, Godard makes certain we notice all the consumer advertising and media nonsense by which Charlotte is surrounded and to which she gives herself rather gladly. And there's the usual social critique, too: bourgeois life and its discontents. 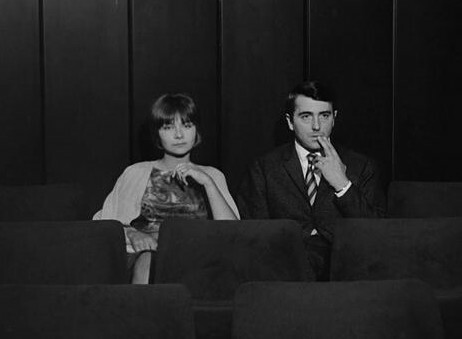 But thanks to Méril, there's greater depth of character here, while Godard's dialog is better than in many of the "master's" movies, making full use of the French penchant for philosophy but more charmingly so than usual -- without toppling over into cutesiness. Too often this filmmaker gets bogged down in appearing to make an exercise in intellectual one-upmanship, rather than a full-fledged, intelligent and emotionally engaging movie. The guy can't resist showing us how smart he is -- which can only go so far in terms of real filmmaking. Deconstruction is fine, but construction is better. 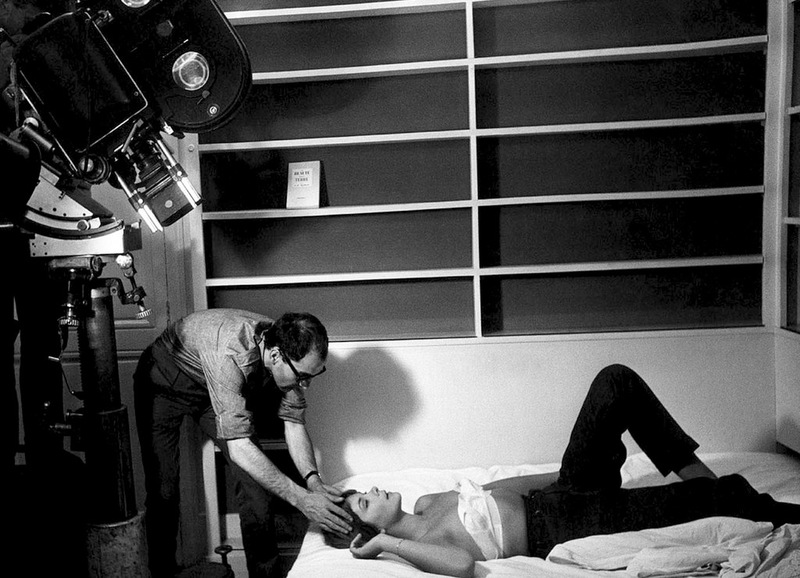 But if you, too, want to try feeling superior, by all means give Godard's oeuvre a good going over. Meanwhile, take a gander at the excellent Blu-ray transfer that the Cohen Film Collection has given this near-classic release. Part of Cohen's Classics of French Cinema collection, A Married Woman makes its Blu-ray and DVD debit this Tuesday, May 24 -- for purchase or rental.